What an interesting week. This week didn’t necessarily go as planned, but in the end, I made the right decisions for training. I intended to have another high mileage week, but needed to cut back as a prevention. My body was tight and sore for every run this week, so I added in some extra rest days to recover. My biggest focus is staying injury free so I listened to the warning signs and played it safe. I started the week with Body Fusion, and I felt great. We used heavier weights and I could feel myself getting stronger with each rep. Yoga was on point as well, and it really helped to clear my mind. I may have even become a little emotional towards the end. Tuesday went downhill quickly. I went up to the track, but even as I started my warm up, which was a 10 minute pace, I was falling apart. I figured I’d play it by ear, and try not to push myself too much due to the heat. Well, I barely got one mile repeat in before I threw in the towel. I struggled and could feel myself fading fast. So I did a mile cool down, and decided I’d push my speed work to Thursday. I spent all night beating myself up about the workout, but in the end, I know my body was still tired and partially dehydrated from Sunday. Even though my mile pace wasn’t horrible, I don’t think I would have benefited from overdoing it in the heat. Wednesday was a rest day, which my body gratefully took advantage of. Then Thursday I did an easy shakeout run before Friday’s race. I ran part of the neighborhood and part on the trail. My pace was probably quicker than I wanted the night before a race, but I tried to keep it light and easy. Friday was the Twin Sizzler 5k and 10k. Yep, you read that right, I ran both the 5k and 10k. I’ll have my recap later this week, but it was also my long run, so I added on 5 miles in between and after the races. I ran a half mile warm up, ran the 5k, ran 1.5 miles around town with Mo, ran the 10k, ran 2 miles around town, and finished up the last mile in my development for a total of 14 miles. This was definitely a tough run because the later it got, the hotter it was and I was struggling. My legs were tight for about 12 of the 14 miles and my knees and arch starting hurting towards the end. It wasn’t pretty, but I got it done. 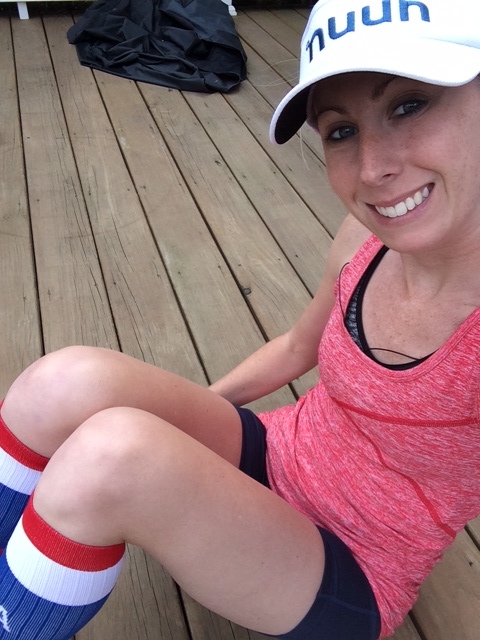 14 red, white, and blue miles! Saturday I took as a rest day because my legs were in rough shape. Sunday I had planned to do an easy run, but ended up having a little too much fun from the wine party we hosted Saturday evening. Instead I spent the day on the deck, enjoying summer and time with my better half. This week was rough, and I struggled with the heat. I thought I was hydrating enough, but apparently I’m not. Looks like I need to increase my intake of water and Nuun every day. I also need to work on adjusting with the heat. I’m ok for the first half of my long runs, but that changes quickly. This week was supposed to be my cut back week, but I’ll be changing that since I had low mileage last week. I need to make sure I hit my mile repeats at the track this week, and I’ll be adding in a hill workout, because after Friday’s 10k, it’s clear I’m not doing enough hills!